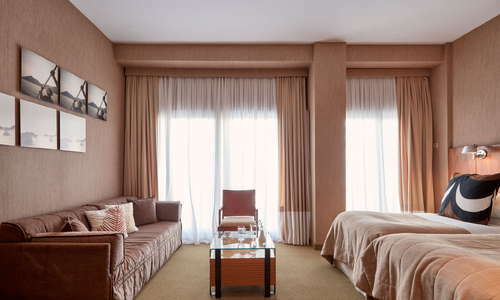 Just around the corner from its sister hotel, the Herodion, the Philippos shares its sister property's best qualities, namely a quiet location convenient to the Acropolis and friendly, efficient service. 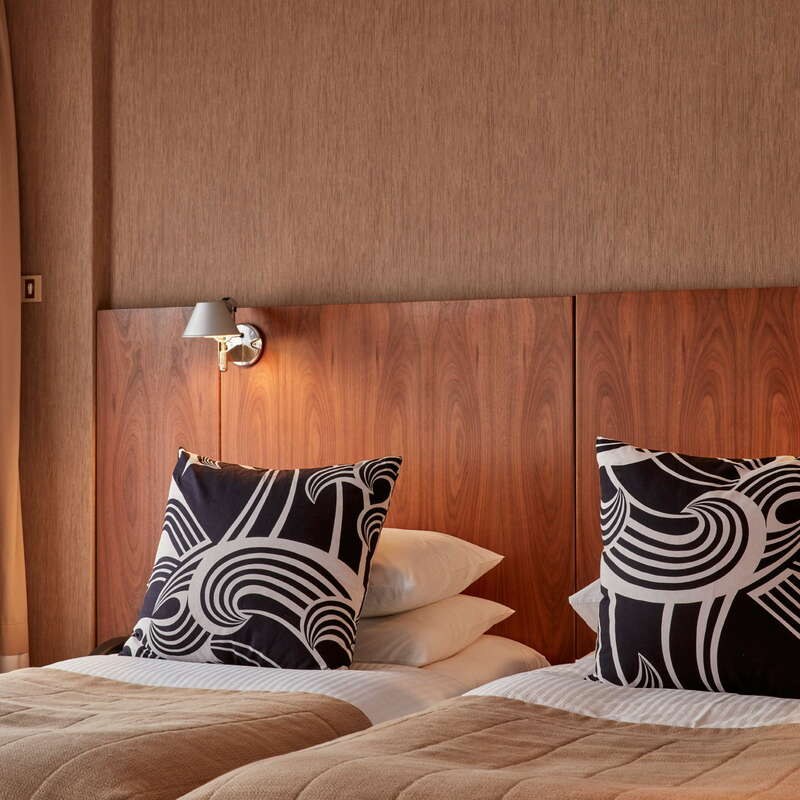 There is an elegant ambiance throughout the hotel's communal areas, with some unique ethnic furniture, vases of fresh flowers and cushions with geometric designs. The rooftop terrace is a nice recent addition and it is possible to take your drink there from the Atrium cafe downstairs and simply relax in one of the sun loungers. YOU SHOULD KNOW Everything is on the compact side, including rooms, bathrooms, balconies (for first 3 floors), and the breakfast area. Modular dark-veneer beds (in smallish rooms) with beige covers are offset by pale green carpets and draperies. 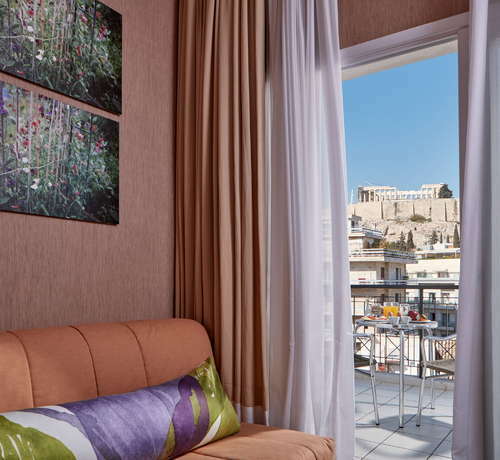 Some rooms (mainly on the top floors) even have an Acropolis view (admittedly behind a few buildings and antennae). 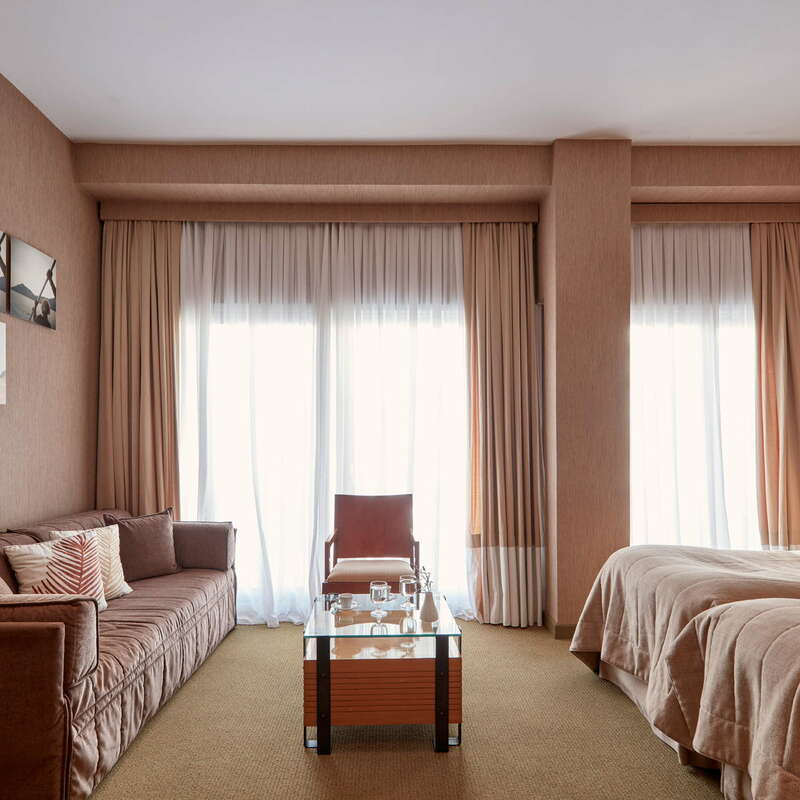 The rooms are kept clean and feel cozy. There is a mini-fridge and a/c but no coffee/tea making facilities. Pillow menu and additional towels on demand. Avoid room number 104, which has a slightly awkward layout due to a fire exit inside. Bathrooms have a small bath or shower. Most of them are very compact but manage to be functional, with attractive grey-ish marble slabs and modern white units. The lobby exudes a relaxed and inviting vibe, with a pleasant reading area, modern leather sofas, black and white picture frames, vases of fresh flowers and a rooftop panel that allows plenty of natural light in the atrium. There is also a business corner and meeting rooms. Reception desk staff is happy to help with every request including cruise and tour bookings, exchange service and luggage storage. Phillipos takes pride in its buffet breakfast served daily from 7am to 10.30am. 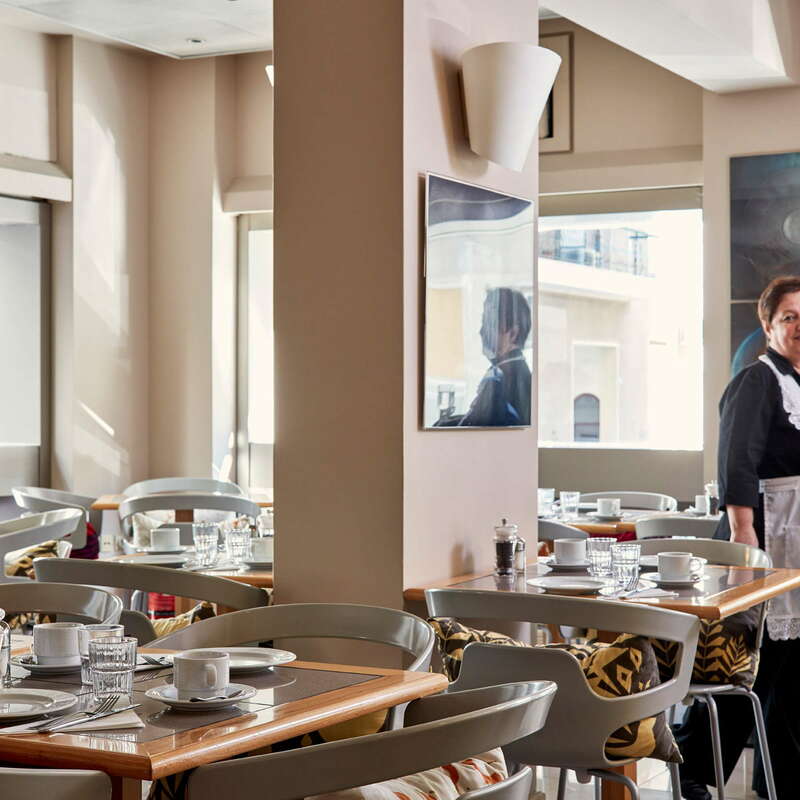 The selection on offer includes Greek delicacies like cheese pie or cream pie (bougatsa) and Philippos has been certified as a 'Greek Breakfast serving' hotel by the Greek Chamber of Commerce. 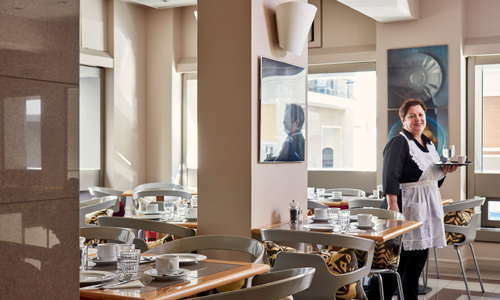 Although the Philippos has no rooftop restaurant, lunch and dinner are served at the Herodion, 40 meters away, where there are two eateries, rooftop Point A and the Atrium. YOU SHOULD KNOW An early breakfast or lunch box is available upon request. Philippos guests are diverted back to the sister hotel Herodion where there is an elegant bar next to the aforementioned Atrium bistrot with more seating. The cafe at Philippos however does serve drinks and beverages on site all day long. The Acropolis metro stop on the Red Line is a 2-minute walk and the metro will take you to Syntagma square where you can change onto the Blue Line for an easy airport transfer. A taxi ride is also possible and the taxi driver will drop you off right in front of the hotel. Expect to pay between 35 euros and 55 euros (if traveling between 12am and 5 am). The nearest major road is Syngrou avenue and the port of Piraeus is a swift 15-minute taxi ride. Plaka and Monastiraki are 10 and 20 minutes walk respectively through a mostly traffic-free, pleasant part of Athens. 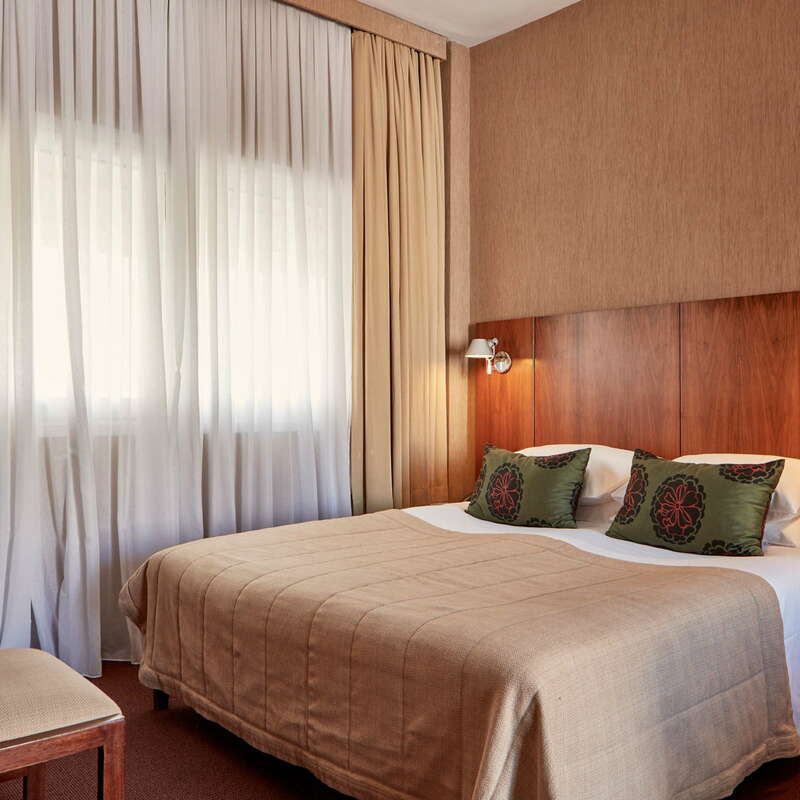 If you want to give the Herodion's Point A a go, the Philippos' sister hotel is just 1-minute walk away. 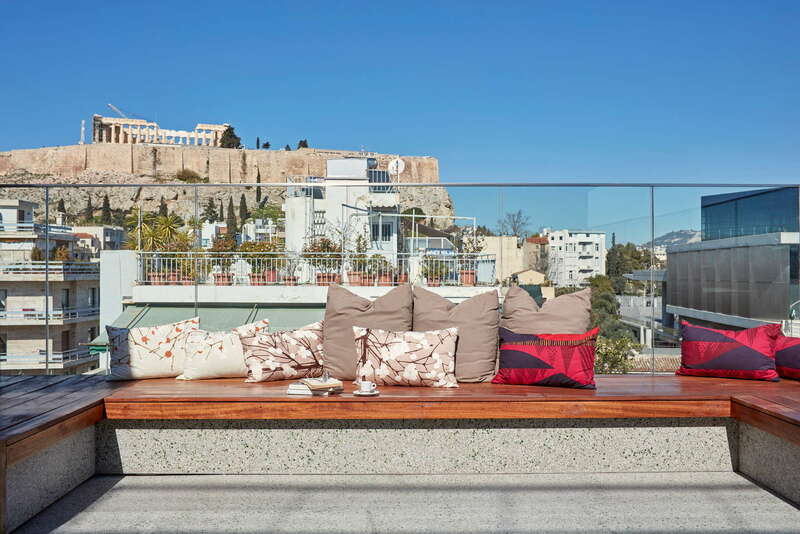 The rooftop bar restaurant is open from May to October and enjoys a winning combination of Acropolis views and signature gourmet dishes like loukoumades (dumplings with manouri cheese) and 'sofrito' from beef sirloin. ManiMani with its Maniot (Pelopponese) menu is relaxed and child-friendly (3-minute walk) while if you like pasta go to Tha sou kano makaronia (5-minute walk) which specializes in pasta dishes at very reasonable prices. For special occasions, Balcony (3-minute walk) is another gourmet restaurant to consider, especially if you can get a rooftop table (reservations required). Again, the Herodion's Point A (1-minute walk) is a good place to start your evening, as it has a separate bar area overlooking the Acropolis museum and is actually renown for its cocktails. After enjoying that quintessential view, you will come down to ground level and continue your evening at Hitchcocktales lounge bar (5-minute walk). Try to guess the ingredients of their secret cocktail before moving on to your final destination which should be exotic Tiki bar (5-minute walk). 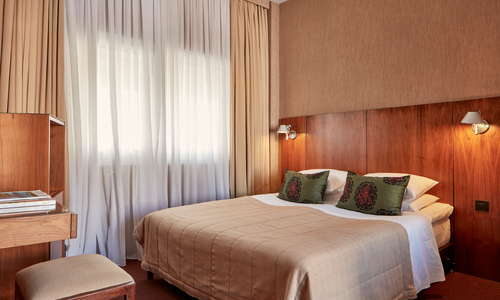 A fairly economical hotel for the area, the Philippos offers an attractive base for your Athens stay. 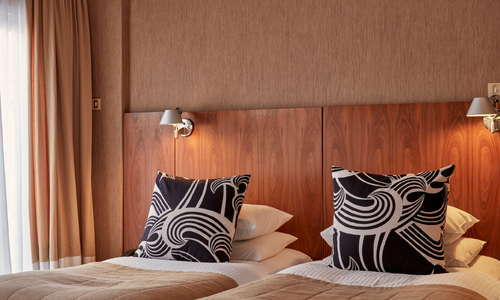 It has a cozy feeling of a home away from home in the communal areas and simple but on point amenities and cleanliness in the rooms. Its location means everything is walking distance and in a traffic-free zone, which is important, as traffic in Athens can be chaotic at times. The staff is willing to help with every request and the breakfast is ample with some tasty Greek and international selections.